—This article by Jerry Cates and Tom Sinclair, with contributions from Matthijs Hollanders, first published on 4 May 2010, was last revised on 24 April 2016. © Bugsinthenews Vol. 11:05(3). Tom Sinclair is a retired businessman who just happens to have been born a couple of months later than I. Retirement allows him to follow his first love by, among other things, studying the behaviour and life history of the western pygmy rattlesnakes found in the Sam Houston National Forest, north of Houston, Texas. Matthijs Hollanders helps Tom in this work, and is also an accomplished photographer. The photo at left is of one specimen Tom found on the night of June 8, 2010, while searching for additional snakes to add to his study. 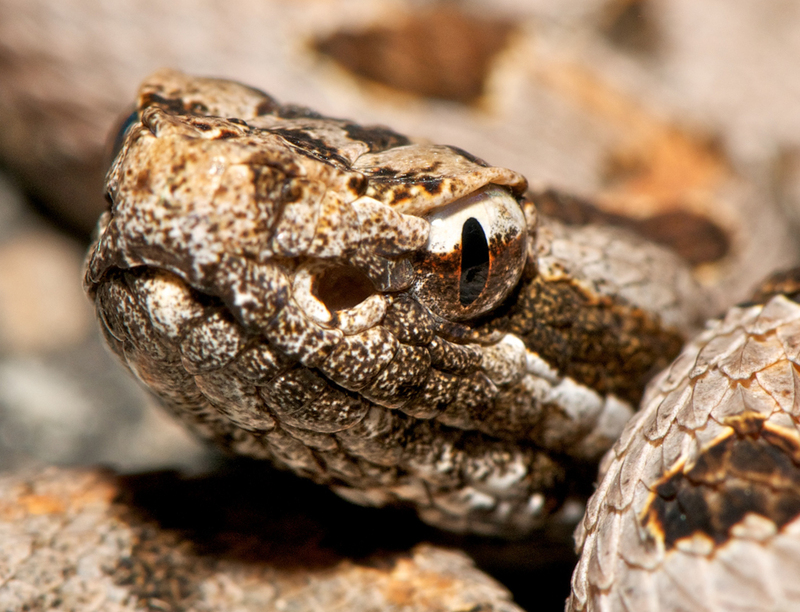 The western pygmy rattlesnake is a smallish, gray-brown or pale gray rattlesnake, usually with short, distinctive lateral marks, wider than long, regularly spaced along its spine, and one to three rows of small splotches on its lateral body. A pale orange wash extends along the spine as a series of short dashes that separate the spinal bars without encroaching on them. The effect is of an indistinct orange spinal stripe, but on close examination one can see that the “stripe” is actually broken up between each bar. This serpent is found throughout the southeast U.S., at least within the wooded or open lowlands along the upper Gulf coast of Texas, the hilly forests of east Texas, and similar habitats in Louisiana, Mississippi, Alabama, Georgia, and Florida. On the Atlantic seaboard it–or one of the other closely related subspecies– is sometimes found in a narrow strip of coastal forest from Florida to the southeastern tip of Pennsylvania. The head of this species is prominently marked by a pair of dark, wavy, parallel black markings that originate between the eyes (actually commencing at the posterior edge of each eye) and extend backward to the nape of the neck. Another dark mark, on the face, extends from the posterior eye backward to the mouthline. 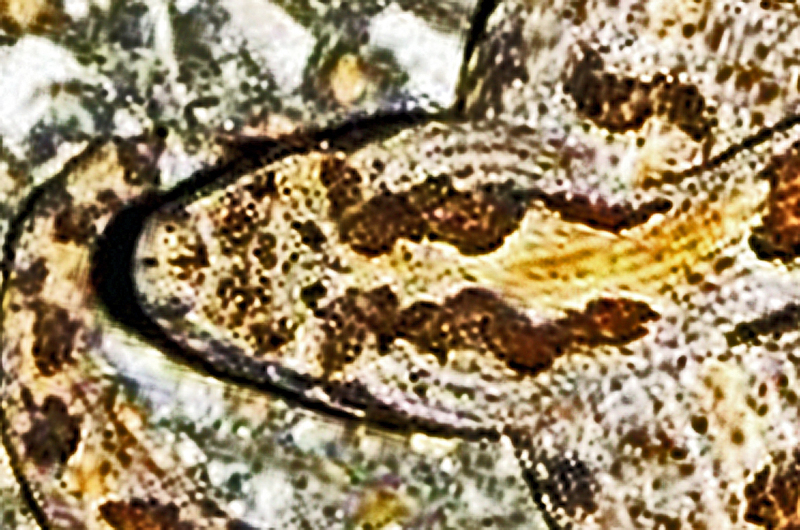 This species, along with all other snakes in the genus Sistrurus (and of the genus Agkistrodon, i.e., the copperheads and cottonmouths), has nine large scales on the frontal dorsum of the head. Being a rattlesnake, it also has a rattle at the tip of its tail, though the rattle is so tiny that one must be within four or five feet of the snake to hear it, and even then it is not very loud and makes a buzzing sound more than that of a rattle. 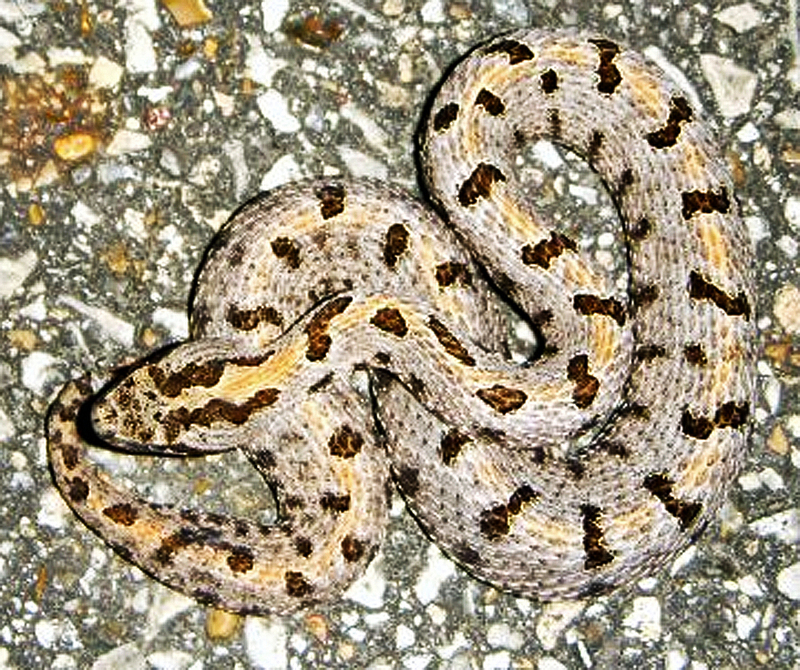 Some studies have suggested that the snake uses its pale, banded tail as a lure. If so, this is also the way juvenile copperheads and cottonmouths use their (juvenile) sulfur-colored tails, holding them above their bodies and waving them in a way that simulates the appearance of an insect. 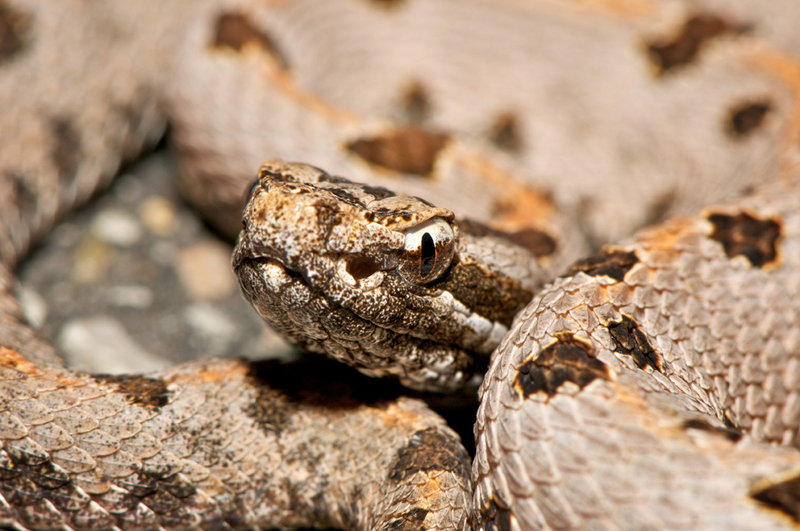 Adult western pygmy rattlesnakes often attain the modest length of 20 inches, but seldom exceed that. The maximum length, according to Werler and Dixon, in their book “Texas Snakes” (pg. 410) is 25 and 1/8th inches. As might be expected, the striking distance of so small a rattlesnake is no more than four or five inches. While it is a pugnacious, short-tempered serpent, few human snakebites have been recorded. Of those, no fatalities have ever been noted. Studies show that its venom is less virulent than that of other Texas rattlesnakes, and is produced in markedly lower quantities by the serpent. Bites produce serious localized symptoms at first, including pain and moderate swelling, and may later produce systemic effects such as hemorrhaging, blood in the urine, and difficulty breathing. However, tissue necrosis common to bites from other pit vipers is not typical (though, apparently, sometimes does occur in children), and often the person bitten recovers fully, without any recurring symptoms, within a few days. Small children, the infirm, and elderly persons with compromised immune systems are likely to suffer much more serious symptoms, of course. Its typical diet includes a range of vertebrate and invertebrate prey. Insects, centipedes, spiders, lizards, small snakes, small birds, mice and voles have been found in the intestinal tracts of these serpents. I hit the SHNF tonight, and for a while it looked like it was going to be a wasted effort. Then at 9:15 a copperhead was found, and three minutes later this beautiful little subadult male streckeri showed up. My young friend Matthijs Hollanders took the picture right there on the road. About 19 minutes later we found another copperhead, and finally, at 10:09, we saw a broad-banded water snake (Nerodia fasciata). No pictures were taken of anything but the Pygmy, but I thought you would like to see that one. The photograph Matthijs took is shown in its original format first, then a cropped enlargement of the head follows. These photographs have not been processed in any way besides cropping and modifying image dimensions. Note the way the orange wash along the spine booms in in the background of the photo. The rather large eye, especially for a pit viper, is a prominent part of the image. Even with a flash the cat’s eye pupil is very obvious. As with the rattlesnakes in general, a thick supraocular scale protects the eye from above like a shield of armor. A large heat-sensing pit is in front of the eye. One gets the impression from this photo that the western pygmy rattlesnake digs in the dirt a bit, as its rostral scale is very large and, in this specimen, appears to have some scuff marks on it. These features are all the more impressive in the enlargement shown at left. No doubt, with all the ophidian fauna in the SHNF, Tom and Matthijs will be sending me additional photos to post. I asked Tom if this was a particularly fruitful night, or one that was typical for his surveys in the Sam Houston National Forest. He replied that he normally sees ten to fifteen copperheads, and one or two pygmy rattlesnakes every time he surveys the forest after dark. I presume those sightings take place in a one to two hour survey trek, which would mean one sighting about every four to eight minutes. And that doesn’t count the non-venomous serpents or the unusual venomous ones. In fact, he’d forgotten to tell me, in his initial message about this survey, that he’d seen a coral snake on the trail this time, but it got off the road too fast for him to catch or photograph it. This is good information, and should point out to anyone who likes to camp out in the backcountry how important it is to wear protective boots and clothing when hiking in the woods, especially after dark. Sturdy leather boots with 12 inches or more of shaft will protect against most bites from most pit vipers. Heavy duck or denim clothing over the boots provide added protection as well. Tom Sinclair has an interesting life story. Matthijs Hollanders is a young photographer and budding herpetologist with a deep, abiding interest in nature. One of my goals is to meet up with these two in the Sam Houston National Forest one day soon, to learn more about them and the work they are doing to study this interesting reptile. —Questions? Corrections? Comments? BUG ME RIGHT NOW! Telephone Jerry directly at 512-331-1111, or e-mail jerry.cates@entomobiotics.com. You may also leave a comment in the space provided below. Thanks, Mike. Keep me posted on your research.